Please use the resources below to help determine if a puppy, older dog, or a rescue dog will meet your personal preferences and fit into your lifestyle. With the increase in popularity of the Golden Retriever has come a corresponding decrease in the overall quality of some Goldens being bred. AKC papers alone are no indication of the quality of a puppy. An AKC registration form is comparable to a birth certificate, nothing more! Responsible breeders look for breeding stock that best exemplifies the breed standard, a written description of the ideal size, color, and temperament of the breed, as well as correct proportion, structure, and movement. The GRCA site describes the official Golden Retriever Breed Standard. 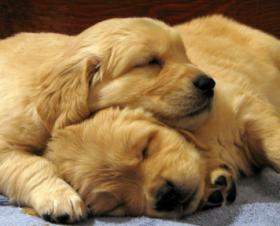 In looking for a Golden puppy, you will notice that prices vary widely. Discuss costs and other issues with all the breeders you meet. Be sure the breeder you choose is someone you are comfortable with; a responsible breeder will be available to help and advise you throughout the life of the puppy. Is a Golden Retriever the Right Dog for You? To contact a Yankee Golden Retriever Club Breeder Referral Volunteer, please call or e-mail the one closest to your home. Our volunteers will do their best to help you and your family in your search for a Golden Retriever by providing you with the names and telephone numbers of breeders who have met the club’s guidelines for litter listings.